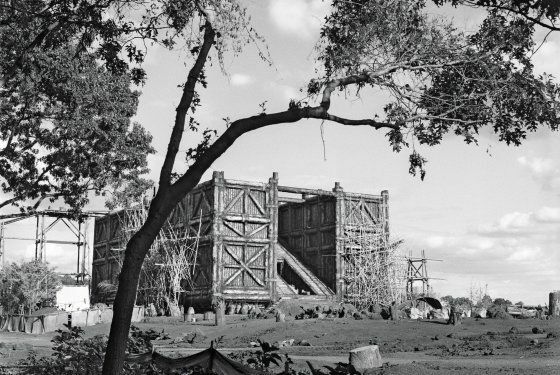 We had previously seen an image of an under-construction ark from Darren Aronofsky‘s Noah, but now we can see what the completed structure looks like. The photo was taken at Oyster Bay’s Planting Fields Arboretum by Dan Wagner for New York Magazine. As you may notice, it’s not boat-like, but that makes sense. The ark wasn’t built to go anywhere; it was built to withstand the deluge. Additionally, Wagner says “The set decorator brought in tree stumps that weren’t there before, to give the effect that the ark was made with local lumber. And there’s no way Noah and his sons could have built such an enormous structure themselves. That would have taken 500 years.” In all fairness, what else did they have to do with their time? Hit the jump to check out the image. The film stars Russell Crowe, Emma Watson, Jennifer Connelly, Logan Lerman, Douglas Booth, Ray Winstone, Anthony Hopkins, Kevin Durand, Martin Csokas, and Mark Margolis. Noah opens March 28, 2014.